Home / Reporting Services / How to Refresh Reporting Services Cache? I am working for a client which uses a Datawarehouse in which the data is loaded once a day during the night. During the rest of the day, nothing changes in the datawarehouse. After a couple of years, the database grows and grows and reports are getting slower and slower. Another problem is that they use Reporting Services as a front-end tool with some reports performing very bad, also after tweaking indexes and queries. This article will give you a method of using caching to fix the performance problems and speed up your reporting services report by 100%! We use several heavy reports in Microsoft Reporting Services to show data to the business users, and it really saves the day to cache them. 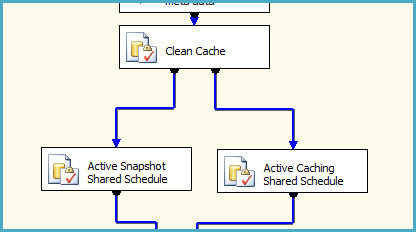 Caching means that the server saves a temporary “snapshot” of the report in it’s cache so it will popup immediately! The performance improvement is great, but there is one problem. 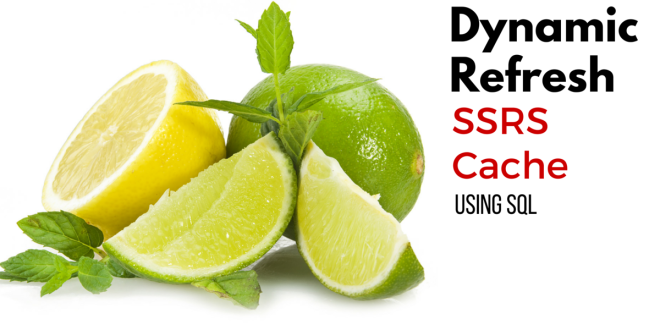 I don’t know exactly when the data is “ready to serve”, and I need to refresh the cached reports dynamically. With dynamically I mean, parameter based. I also need to cleanup the SSRS Cache first. 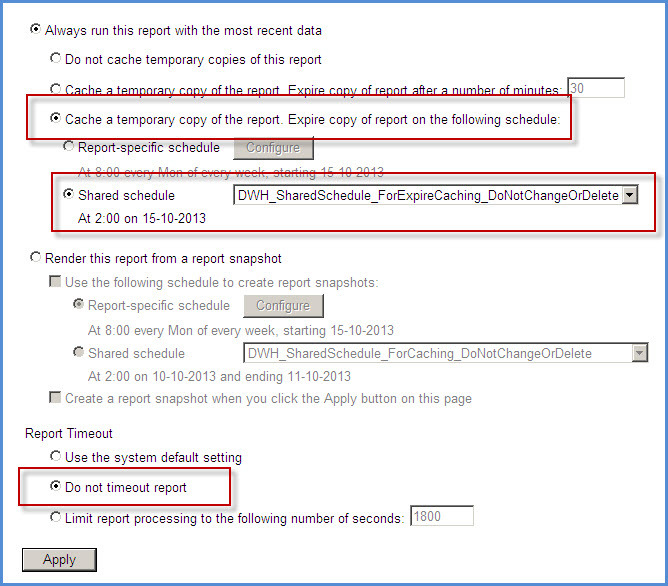 In Microsoft Reporting Services, there are two options for pre-loading Reports; caching and snapshots. A snapshot is like a piece of paper, a static instance of the report. After the snapshot is taken, nothing can be changed in the parameters. Caching is different. It can save different “instances” of the report (same report with different parameters configurations) and can save this into the TempDB till it expires. A cached instance will be cleaned from cache after it expires. There is no way you can “Re-Cache” things (only with an advanced cache refresh plan, out of scope). When you re-run caching, SSRS looks in the database for the Instance and sees that it is already cached and will leave the old results in database. It will do this with the parameters given (fingerprint). This is a very important thing to understand. A report won’t stay in the cache indefinitely. It will be removed if the report is set to expire, if the report is modified, if the parameters are modified, if the credentials of the data source change, if any other execution options change, or if you delete the report. So one thing to keep in mind with Null Delivery is that the copy of the report in cache must be expired before you create a new copy using this method. I would suggest setting up the report cache to expire on a specific schedule, shortly before this subscription runs. There are two methods of getting (not refreshing, this is a wrong term) the data of the cache or a snapshot; specific on a time OR with a shared schedule. As you can see, none of these options work for me, so I looked a bit in detail in what options I have to refresh the cache manually. Concept: we use two shared schedules, these are dummy shared schedules. 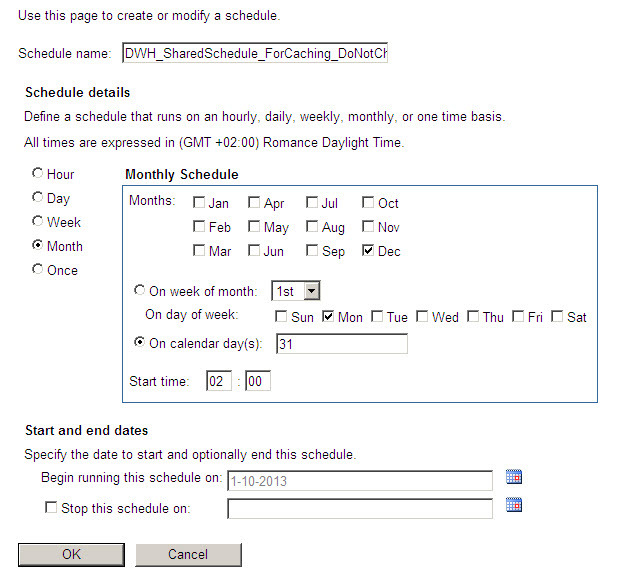 We will attach the reports we want to cache/expire to this shared schedules. The first one we use to trigger report cache expiration. The second one we use for caching the results. At the end of our datawarehouse load, we trigger the shared schedules at a specific moment,. All the caching of the attached reports will be deleted and will be refilled! I will take you through the steps to get the job done! We use this to activate caching and cleaning cach for all reports. You cannot set “Run Once” with a runtime in the past, otherwise it will never work. This wil cause the subscription to expire immediately after the caching has run! I discovered this because my caching didn’t work. It wil create duplicate caching records in database with the same hash value, alle expired. So my conclusion is that SSRS will check the Shared Schedule attached to the “expire value” to verify when it needs to expire. When this shared schedule is already expired, the cache is immediately expired when it’s saved to the table, the data is 1970-01-01! The Next run is in future, schedule also and expired column is empty! Double check! SSRS will create an agent job for this schedule. You can view this job in the Agent. The scheduling of this job will be set to the time you have defined. You can also check the step it creates! For now, we delete this job. It pollute your agent job tasks and we don’t start the job via the agent. 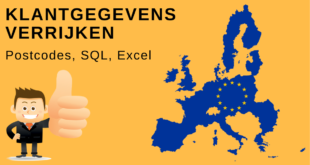 We will start the job in SSIS at the end of our ETL process. Go to the SSRS report (via report manager) which is performing bad, this one is going to be setup for caching via a NULL Delivery subscription. Click on the “Subscription” tab and create a new data driven subcription of type “Null Delivery Provider”. You need a SQL Server Enterprise License to use this feature. When the button is not there, you probably have the Standard Edition. Note that you have to enter the password every time you edit the subscription. Press Validate to check if everything is fine. Press next, next. 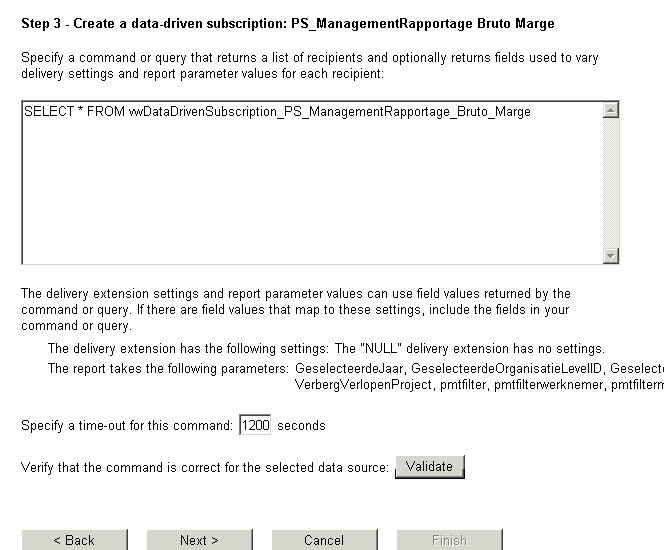 Now map every parameter from the view or sql command to the report parameter. Every combination will be cached. Each time you edit this subscription, you have to complete the connection password. Cache a temporary copy of the report. Expire copy of report on the following schedule: Shared schedule -> the schedule we created in the first step, the expire shared schedule. Now we have setup a Data Driven Subscription of Type “NULL Delivery”. Nothing will be send by mail, just generate the report for caching purposes. The next thing is to give the shared schedule a kick so it will run. 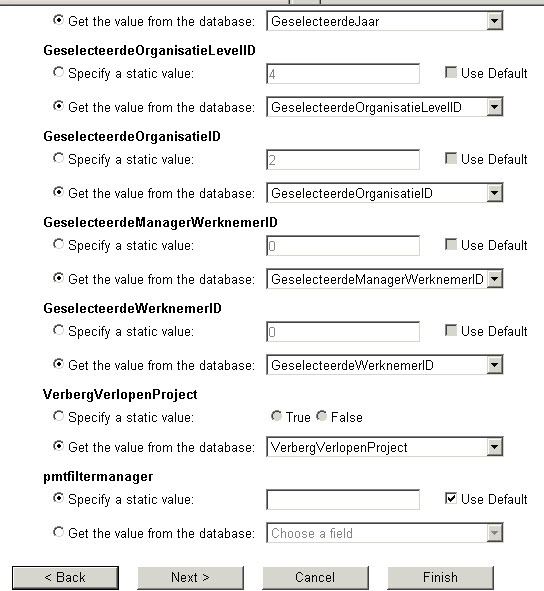 This can be done using the AddEvent procedure against the Report Server database. First we retrieve the GUID of t he dummy shared schedule. Then we add the SharedSchedule event to the event table. 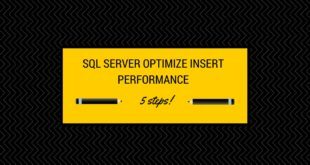 SSRS scans this table every second and will execute it! But important, first clean the cache of all reports, attached to expire with this shared schedule. 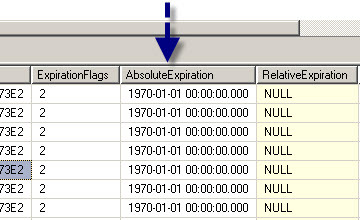 You can also check in the database if the result is cached and when it will expire (AbsoluteExpiration field). Replace the UID with the UID of the subscriptionID from the dbo.Subscription table. I discovered this when I was looking in the execution log, the byte count for the NULL-delivery subscription was 0, this means that the report was run from Cache. So when the NULL delivery was activated, SSRS had a fingerprint of the parameters (so cache exists). And here is the SQL statement which you can use to check if a NULL-Delivery Subscription has been run. This is an example for one report. Check the rowcount! If it’s 0, it means the report has been run from cache. I think SSRS needs some delay in processing caching and the expire cache option because I run this SQL from a stored procedure. This is hard to test. My solution for now is to delete alle the cache, hard coded. This can be accomplished with this SQL . I only delete the cache from the DWH_NL folder in this example. -- command to know sure that all cache has been expired. If you got any questions, leave a reply. It was a very hard job to get this working. I hope this article will help you out getting the job done. Thanks for your blog post which shines a lot of light on this very effective (but poorly-documented) functionality in SSRS. I also noticed that deploying a report from Visual Studio also clears all caches for that report. Thanks Mike. There is hardly NO documentation available about this subject. It was a nice job to discover how everything works under water. I hope this article helps you to get things done! Thanks a lot for putting your effort into a blog. It helped a lot 🙂 Your solution is working great. I have no idea why such a basic feature like cache Invalidation/refresh cannot be triggered easily by standard. In addition to your “NULL delivery provider” I’m using your method successfully for cache refresh plans and I think I’ll use it in the near future for our subscriptions too (assure that subscriptions go out after ETL has finished). Hi Ronald, thanks a lot for this clear blog with full tips. I’ve implemented it and it works lovelly. I’ve just one issue and I’m wondering if you run into it. I’ve configured the caching for 2 reports: the reports are exactly the same but with 2 different names. Do you have any idea why the other report is not being cached? I’m using SQL Server 2012 SP1. 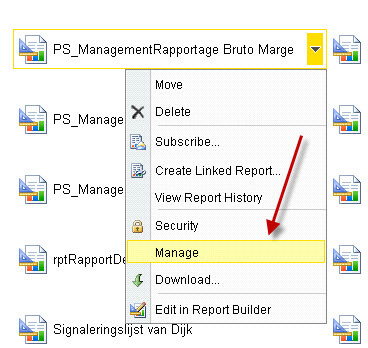 The reports are deployed on a Sharepoint 2013 site. It’s been a while since I was programming this piece. I have not run into this issue. Every report has an unique ID so even when they are the same, they are unique in the database. Awesome article, just what I was looking for. Thank you. You’re welcome. It’s really cool to manipulate thing in the SSRS background. 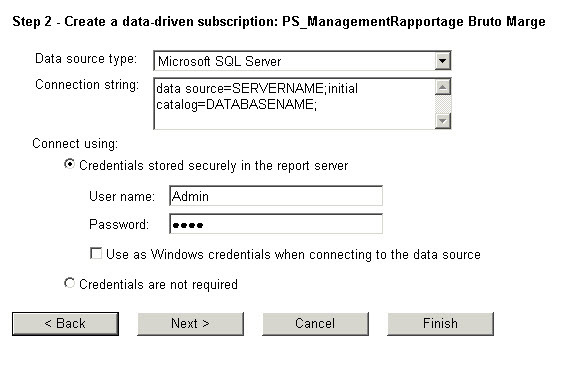 You can build your own subscription system in a front/backoffice application and “push” thing to the SSRS database, really cool. Glad I found this post, thanks for taking the time to clearly walk through it! We have a very similar setup, where we “expire” the shared schedules as a last step in our ETL processing. And, similar to what you’ve experienced, we occasionally see cases where the cache is not actually cleared out, even though the schedule was expired. We added a delay step, but this didn’t always resolve the issue. After further investigation, we’re seeing deadlocks on the report server after we call the “AddEvent” sproc. The deadlock info shows that the delete statement in “FlushReportFromCache” is always the victim; this sproc gets called somewhere after a shared schedule event is added to the events table. 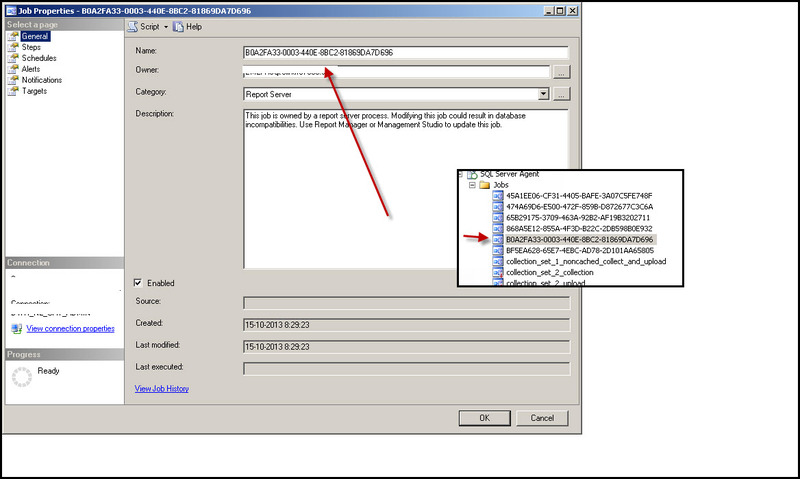 The circular lock involves the “IX_SnapshotDataID” index in the dbo.ExecutionCache table and the “IX_SnapshotData” index in the dbo.SnapshotData table. The deadlocks result in old data remaining in TempDB. Have you experienced this at all? If so, do you have a solution to get around these deadlocks? Thanks! Thanks for the comment’s. I havent’faced this issue myself so no experience with fixing this thing. 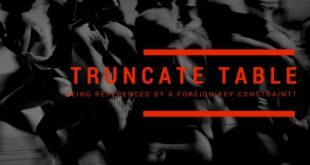 Did you try to delete the cache record “hard” with a delete statement? Thanks for the quick response. We were trying to avoid a “hard” delete if possible, but I’ll keep that approach in my back pocket if I can’t figure anything else out. If I find a solution, I’ll post it in the comments here.